Each year, Blackman's creates a beer for its Oktoberfest. The first was a lager that has gone on to become the unfiltered beauty that's part of the Torquay brewery's core range. And in 2016 brewer Renn opted to concoct a Hopfen Weisse, or hoppy German style wheat beer. If memory serves correctly, the first beer to take such a name was a collaboration between Brooklyn and Schneider-Weisse, while other Aussie versions have been seen in the past, such as Mad Brewers Hoppy Hefe and the one Brooklyn went on to brew with Mountain Goat. 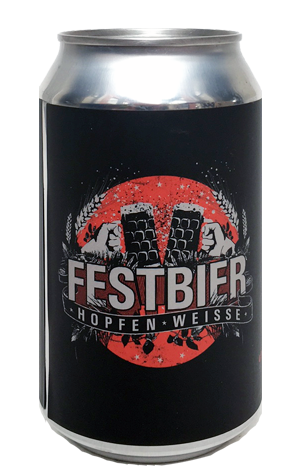 In those cases, they really have been heavily hopped up; here, it's more a case of adding a little late hop flourish to what is still first and foremost a hefeweizen. If you lay your hands upon one of the limited number of cans to be released (50 cases, we believe), you'll realise that straight away as the candy banana aromas of the yeast dominate. A little bubblegum and some tropical melon hop aromas join in, while the beer, despite its upfront sweetness, finishes dry as you like.